Facebook is 6 years old and reaches this week 400 million users. As Mark Zuckerberg announced this is almost twice the number they had a year ago. But the important thing is that the last 50 million users were added in about just 65 days. The growth from form 300 to 350 million took a whole 77 days. The average pace for the last 150 million users has been about 22 million a month. Last year we predicted that Facebook will hit 700 million this year. We did some calculations and found that this is not entirely impossible. 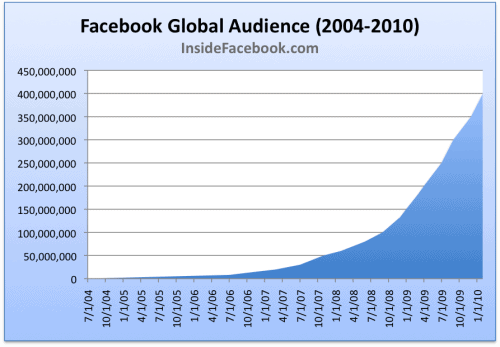 Now, looking back we see that Facebook went from 200 to 400 million with an average pace of 19,1 million users per month. Drawing a straight line from now to December 31 will give us a user base of 610 million. So, our initial 700 million is entirely possible. The question now is if any of the big non-Facebook countries (China, Brazil, Russia, etc) will start to join up in big numbers. This may speed up the growth significantly. Facebook should start seeding by paying the user to join up in these countries and to reach the tipping point. Thanks Stellarstef . China will take time, if it opens up at all for FB. But still, there are pockets of resistance that are not closed by state but just by people choice to use other social networks or low penetration of socnets in general. India for instance has a low socnet penetration and Orkut seems to be the top dog there. This is truly some phenomenal growth. But, don’t count on China to help. I live in China and have to access a VPN just to get on FB. BeiJing has no intentions of letting Facebook back into the country.